SALT LAKE CITY, Utah (July 19, 2012) – Utah’s Intermountain Concours d’Elegance will honor automotive legend Carroll Shelby and the cars he influenced on Saturday, September 22 in The Gardens of Thanksgiving Point in Lehi, Utah. “The world has lost an influential genius with the passing of Carroll Shelby and we plan to showcase several of the historically significant cars tied to his legendary career as both a racecar driver and automotive designer while educating event spectators about his great accomplishments”, said Chris Purdum, concours chairman and partner of the restoration shop Customs and Classics. “Each August, tens of thousands of car collectors and dedicated enthusiasts travel from around the globe to attend the prestigious Pebble Beach Concours d’Elegance in Northern California. While we would never expect to match the magnitude and prestige of this event which has been built over many decades, we are working hard year after year to give this part of the United States an elegant yet friendly concours event to call our own”, explained Purdum. “In my profession, I speak to car owners who long for an event of this nature where their finely restored and original rolling works of art can be proudly displayed and admired by their peers as well as by the general public. This is not a hot rod show. There is no charge to enter a vehicle but there is strict judging criteria in place for those who hope to earn a Best in Class or Best of Show award. Cars must be entered by “application” at our website and the concours board then accepts qualified entries that meet event standards. Expect to see 100 examples from along the automotive timeline including PreWar and PostWar classics, American and European Sportscars, Exotics and more. “We are thrilled with early entries and count several cars with values in the millions. These are stunning vehicles one has to see in person to appreciate”, commented Purdam. Additionally, an exhibit of restored military vehicles will be on display along with numerous vendors who will be on hand offering everything from the latest in high tech car audio equipment to fine jewelry. 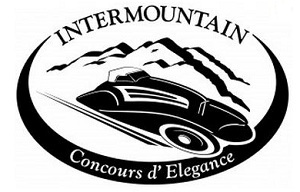 The Intermountain Concours d’Elegance believes in giving back to the community. A portion of the 2012 event proceeds will be donated to local charities that support human need and an announcement naming this year’s organization of choice will be forthcoming. Partners include Miller Motorsports Park, AutoCom, Customs & Classics, MyCarQuest.com, AutoBooks-AeroBooks.com, VeloceToday.com, TheMotoringJournal.com, RideStory.com, CAR PR USA, PreWarCar.com/PostWarCar.com and GarageStyleMagazine.com.